THERMAL INKJET PRINTERS. The cleanest thermal printing technology for any type of surface. Advanced and optimized printhead design allows for a fast and easy integration of TJX Series into any production line. Powered by our unique cartridge protection, the United Barcode Systems Thermal Inkjet printer can be adapted even to the most complicated area of the production line. The United Barcode Systems TIJ Printer control unit presents a user-friendly graphic interface showing status, message name, quantity and cartridge ink level. Thanks to its versatility, the TJX Series printers can be connected through ETHERNET, USB, BLUETOOTH, I/O with any device, like PC, tablet, Smartphone, etc. 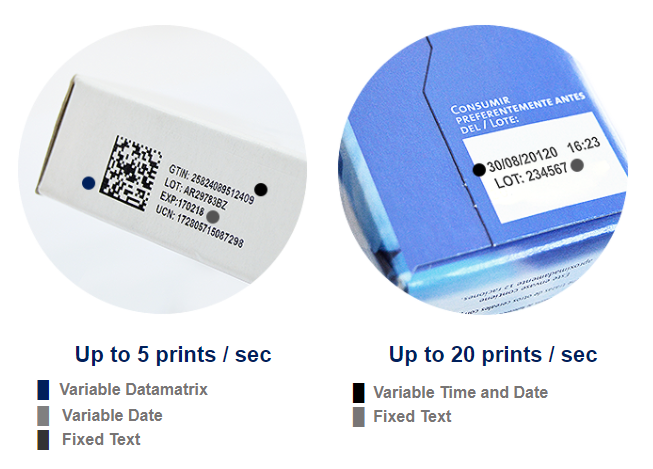 United Barcode Systems technological ink for Thermal Inkjet is developed for direct printing on porous and non-porous surfaces, such as glass, plastic materials, treated substrates, paper, carton, wood and metal among others. The UBS Designer software presents a simple graphic WYSIWYG interface to create and edit messages with multiple options, allows creating and printing texts, images, logos in just few clicks.